Vladimir Isayev, chief researcher of the Center for Arab Studies at the Institute of Oriental Studies under the Russian Academy of Sciences, speaks about the likelihood of new outside attacks on Syria and the possible consequences of escalation in an interview with Vzglyad. 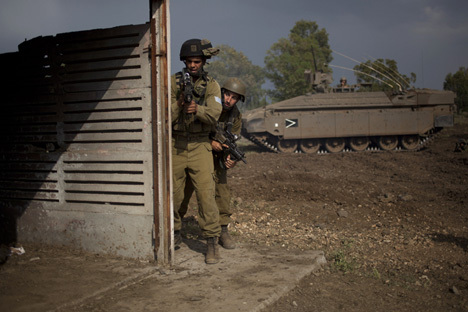 Israel has once again interfered in the Syrian conflict. In response, Damascus has threatened to supply more sophisticated arms to the Palestinians and turned its missiles towards Israel. Are these threats serious at all? Syria is currently unable to effectively confront Israel — its efforts would be pointless. If Syria was unable to deal with the occupation of a part of its territory in more favorable times, it is even weaker now. Syria itself needs weapons very badly; given the full-scale civil war that started two years ago, they are running out of arms and ammunition very fast. The Syrians are asking Russia to increase its deliveries, which we won’t do, although we keep supplying weapons under previous contracts. How capable is Iran of threatening Israel now? Iran has been threatening Israel for some time now. Lebanese Hezbollah regards Israel as its number one enemy and mostly relies on arms supplies from Iran in its struggle. But Iran cannot pose a real threat for now, at least until it gets its hands on nuclear weapons. According to Israeli sources, Syria has provided modern Iranian missiles over to Hezbollah in Lebanon. Is there a chance that Damascus will also supply chemical weapons to that militant group? For instance, if defeat in the civil war becomes inevitable? Based on the current situation, supplies of chemical weapons will automatically turn the supplier into a pariah, and sanctions, including military sanctions, will be imposed. I don’t think the UN will object to a very serious attack against such a pariah in order to capture the stockpiles of chemical weapons that it is trying to give to someone else. If this war goes beyond the borders of Syria, which way will the conflict spread? If Syria falls, Jordan and Lebanon may follow suit, especially Lebanon, which is not very stable now. Over the weekend, the Pentagon said for the first time that arming the rebels was an option. Moscow reiterated that it could mediate the negotiations between the parties in the conflict. Is peaceful dialogue a possibility today? Russia is providing a platform for the Syrian opposition to meet with representatives of the al-Assad regime and reach some favorable agreements to deescalate the conflict. It would be great if the talks end well. However, there is little hope they will. The only hope is that the people supplying weapons to the ones they refer to as the opposition will finally see whom they are delivering their arms to. The United States has admitted—and the UN has confirmed this—that it was the opposition that was responsible for the use of poisonous chemical agents by the Syrian regime during certain recent events. The Americans insist that no one should interfere, because you never know where these weapons will be ultimately discovered. The current supplies may end up in Mali or Algeria, where the opposition carries out terrorist attacks. From this point of view, certain countries that are interested in the Syrian affairs should finally make up their mind about who should be considered the normal legitimate opposition and leave Syria alone. The Syrians should decide for themselves in this long-suffering land.